A 43 yo male with left side lower limb radiating pain. MRI Lumbar spine : sagittal T2, axial T2 and MR Myelography images. A cystic lesion iso intense to Csf in sacral canal at the level of S2. 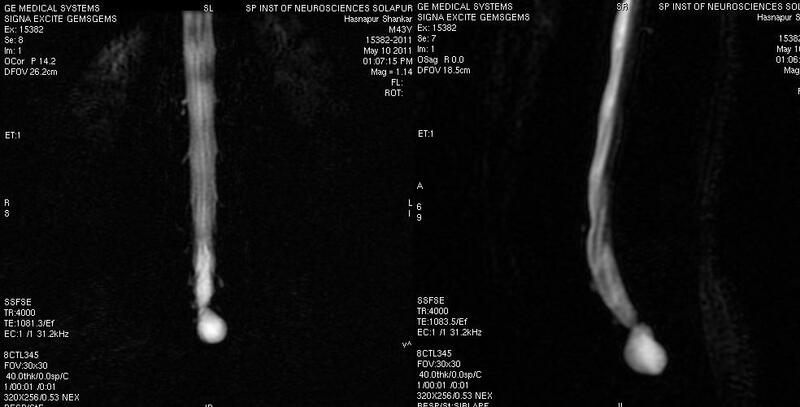 Left traversing S2 nerve root seen separately in lateral recess with possible compression. An associated adjacent scalloping of bony walls of sacral canal. Imaging wise diagnosis : Tarlov's cyst. Also known as Sacral Perineurial Cyst. A Csf filled sac located in the spinal canal, formed within the nerve root sheath commonly found in sacral canal along the dorsal root ganglion. Occasionally in thoracic region. Various hypotheses regarding the formation of these cyst are one is inflammation within the nerve root sheath followed by inoculation of fluids others are developmental or congenital origin, arachnoidal proliferation along the nerve root. Tendency of cyst to enlarge over a period of time is due to Csf being pushed into the cyst during systole pulsation but unable to get out of it - a ball valve like mechanism. Usually asymptomatic, often detected incidentally during MRI. Cysts with diameters of over 2cm are more likely to be symptomatic due to compression over neighboring nerve roots. An associated adjacent bone erosion, neural foraminal or spinal canal expansion or scalloping is common. The term Tarlov cysts often been misused or over used for referring to other cystic lesions in the sacral region. 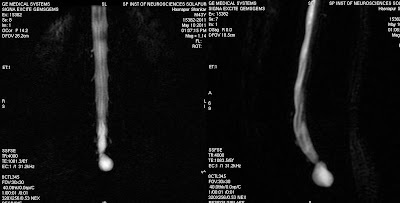 Tarlov cysts are often detected through MRI, but MRI cannot distinguish one major difference between Tarlov cysts and other cysts is the fact the walls contain nerve fibers. Therefore, the final diagnosis of a Tarlov cyst is not a radiological but rather a histopathological. Excellent illustration of the case!